For other places named Stonecrest, see Stonecrest (disambiguation). Stonecrest is a city in DeKalb County, Georgia, United States. The boundaries of the city generally lie in the far southeastern corner of the county, and a smaller portion just north of Interstate 20. 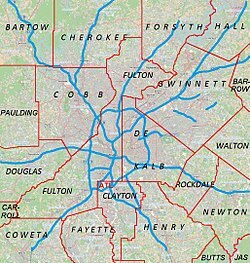 The city borders the existing municipality of Lithonia, as well as Rockdale and Henry counties. Residents in the area voted in the November 2016 General Election to approve the city. In March 2017, elections were held to elect representatives for five city council districts as well as mayor. Jason Lary, a former insurance executive, concert promoter, and advocate of incorporation was elected the city's first mayor. The City Council members are District 1, Jimmy Clanton, District 2 Rob Turner, District 3 Jazzmin Cobble, District 4 George Turner and District 5 Diane Adoma. Also the area is represented at the county level by District 5 Commissioner Mereda Davis-Johnson and Super District 7 Commissioner Lorraine Cochran- Johnson. The area is home to the Mall at Stonecrest, for which it is named, as well as the Davidson-Arabia Nature Preserve and Arabia Mountain National Heritage Area. The city had voted a plan to deannex 345 acres of its territory so that the Georgia Legislature could create a new city, to be called Amazon, Georgia, if Stonecrest had been selected to host Amazon's new corporate headquarters, a project which would result in billions of dollars of investment and the creation of 50,000 jobs, a number equal to the estimated population of Stonecrest. ^ a b "US Board on Geographic Names". United States Geological Survey. 2007-10-25. Retrieved 2017-07-18. ^ Rosen, Sam (26 April 2017). "The Border Battles of Atlanta". The Atlantic. Retrieved 26 April 2017. ^ "Information Lookup". Interdevgis.maps.arcgis.com. Retrieved 2017-06-25. ^ "The City of Stonecrest". stonecrestcityalliance.com. Retrieved 2017-06-25. ^ "Stonecrest Yes Committee | Dedicated to Self Governance of Our Future!". Stonecrestga.gov. 2017-06-09. Retrieved 2017-06-25. ^ "Town wants Amazon's new HQ so much it plans to split off new town called 'Amazon'". The Register. Retrieved 4 October 2017. ^ "City of Stonecrest designed for businesses". The Atlanta Journal Constitution. Retrieved 30 October 2017. This page was last edited on 18 March 2019, at 18:14 (UTC).